This was found on a Japanese Catalogue for the Game Gear in '93. This image seems to be either a very early shot of hte game, or a pre-production "painting" of what the game will eventually look like. The side of the road has checkered patterns on the ground, while the final does not. Sonic's passing totem poles through Green Hill Zone, but in the final it's palm trees. 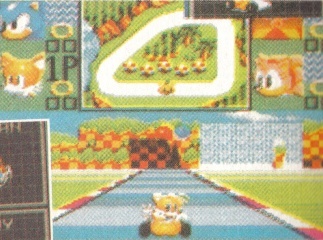 As for the top fo the screen, each characters image is completely different, the sprite for the character on the map a car instead of a head, the map itself does not exist in the game [although it looks similar the the Marble Zone course in the Green Chaos GP] . Most strangely, the 4th player in the prototype is a Flicky bird, and not Amy Rose! 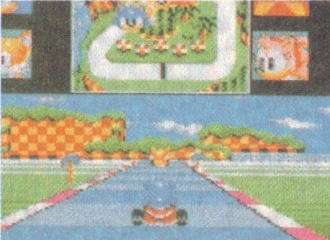 Here's an early shot of Sonic Drift. You'll notice that the HUD seems unfinished, with any score and other data missing entirely. Also, the background scene does not exist in the final version. Lastly, the icons on the HUD are much larger than those in the final version. This image has the same differences as the one above, but a different point in the track. 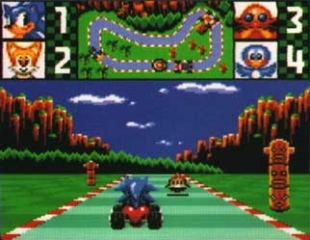 The track is also the Green Hill Track from the Green Chaos GP. Same track and source as the previous two images, but further down the development line. The HUD is still a little muddled with a water block taking up the player square besides the 1st player. Also, the background is similar to that in the final, but had been altered from this. The point where the background is being shown is also incorrect. SD tries to maintain the backgrounds position on the screen to that of the map, it's wrong for this image. Heres a shot from the final game. The waterfall has been altered, as well as the save. 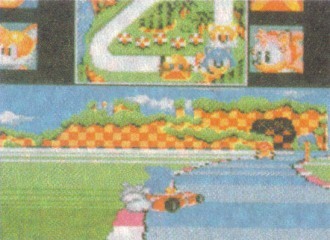 You'll also notice that Sonic's position on the map is different to that in the above image. The waterfall it's looking at is at the top right of the map screen.